North 5500 Series Half Mask Air-Purifying Respirators NIOSH Certified The North 5500 Series is the optimum low maintenance respirator available today for those customers who prefer the comfort and fit of a reusable respirator, while approaching the economy of a disposable respirator. The North 5500 incorporates the anatomic design of the 7700 Series with an extremely soft, hypoallergenic elastomer to provide comfort, fit and ease of maintenance. 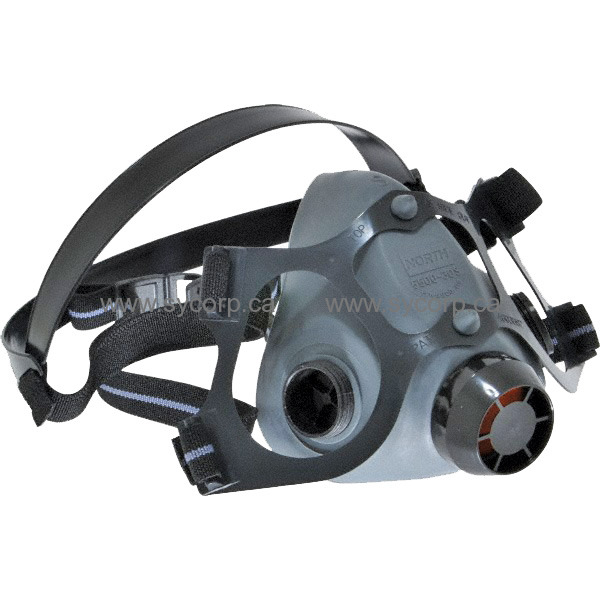 The facepiece conforms gently to the worker's face, and is available in three overlapping sizes to provide the optimum fit for the largest number of respirator wearers. The cradle suspension system adds comfort and provides proper positioning of the respirator, for an even seal without creating sensitive pressure points. All parts are replaceable, extending the useful life of the respirator, plus the complete line of North cartridges and filters can be used with this respirator, eliminating the need for duplicate inventory.